Once a hero, always a hero. The Fantasy Comic League Illuminati cemented that latest ruling on scoring characters who are taking a break from their super powered personas. In regards to the latest week of Marvel Comics, this worked in favor of Jane Foster and Betty Banner who appeared in the latest Thor and Immortal Hulk issues. Both characters had been depowered, but recent events indicated they will be returning to their super powered personas soon. Eddie Brock, one character that did not benefit from this ruling, was left by the Venom symbiote. Unfortunately for him the ruling indicated that the sentient alien suit would be the one to score the points and its ‘hosts’ were regulated to civilians while not bonded with Venom. Apart from the new ruling, the top characters and books from March 20 included Conan who appeared in the top event book Avengers: No Road Home (27 points). He scored 15 points in two books and narrowly edged out Captain Marvel’s 14 points across her three appearances. 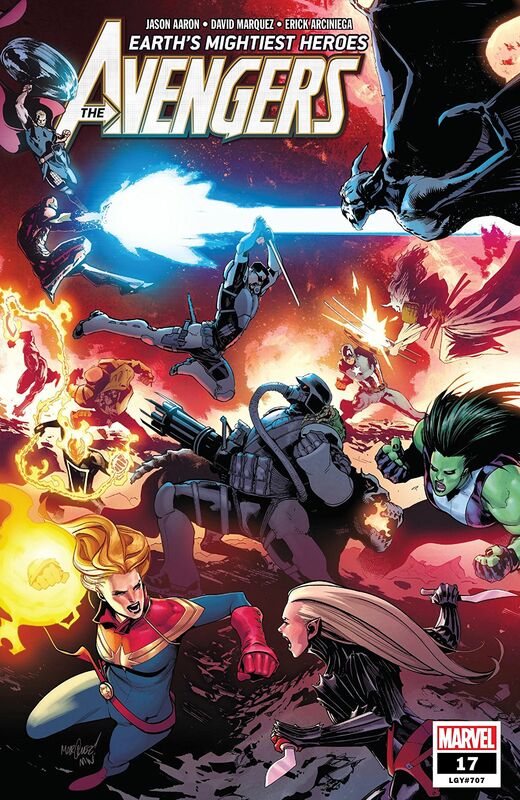 Carol’s latest book tied Thor with 24 points for top solo title from the week. Jason Aaron’s Thor set the stage for the long-gestating and much-anticipated “War of the Realms” which begins next month. With one war looming, another came to an end. The Avengers‘ Vampire War, also penned by Aaron, wrapped up with Dracula regaining his strength and resuming his reign as the top vamp in the Marvel Universe. Avengers earned the overall book of the week, as well as best scoring team book, with 44 points.